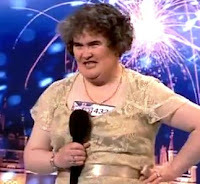 So Susan Boyle is in a clinic recovering from the stresses and strains of the pressures of sudden fame. Who knew, eh? Surely anyone who appears on reality TV must realise by now that there is a limited popularity window of about a month before the inevitable backlash begins. First it’s cool to like them, then it becomes decidedly un-cool to like them (simply because everyone else thinks it’s cool to like them) and then it becomes cool to hate them. It’s the way we function as a society. Some folk survive the backlash and grow to become (albeit minor) celebrities, but the safeguard used by most of them to weather the criticism is exactly what Britain’s Got Talent was looking for; talent. Yes, Susan Boyle had zillions of hits on Youtube, but let’s admit it – no-one was watching it because she was particularly stunning to look at or she had an exceptionally jaw-dropping voice. They were watching it because she is a funny little Scottish woman who everyone can have a good laugh at and who can carry a note (but, to be honest, not any better than the next funny little Scottish woman). It was a freak-show from the second she stepped on stage and nothing more. If the public had admitted this, called a spade a spade and not made such a big deal out of her ‘talent’ (yes, I’m talking to you America) then the media hype would not have reached fever pitch and Susan would have shuffled back up to Scotland a very happy and contended lady, maybe with a record deal with an Easy Listening label in her back pocket. But no, we had to harp on about what a fantastic singer she is (even though she can seemingly sing only one song…), grind the media engine and wait for the inevitable crash into a treatment centre. So now, as a direct result of Susan’s treatment, government ministers are calling for tighter regulations to protect ‘vulnerable reality television contestants’. Hmmm, what exactly do we mean by the word ‘vulnerable’ here? Are we making a comment on an individual’s mental state before they enter into the competition? If so, will TV producers be forced to exclude someone from appearing on a reality TV show if they are deemed to be mentally unstable? Surely that would be a red rag to the equality brigade. Who exactly is going to carry out a thorough assessment of each participant in a show as large as Britain’s Got Talent? And what other groups should we exclude from participating in the event that they might become a danger to themselves? (how about the fire-eaters?! hehe). I suspect that restrictions will be heaped upon reality TV as a result of this and eventually regulations will spiral to the point that it will become impracticable to produce these shows anymore. But maybe that’s the fundamental idea. What viewers of reality TV must realise is that by complaining about the treatment of individuals like Susan Boyle they are pressing the big red self-destruct button. The truth is that the British public love watching unstable people on TV. I’m no psychiatrist but I could tell that Susan was a little ‘unsteady’ as soon as I saw her and I didn’t watch the program to hear her sing, I watched to see what she was going to do and say next. It's cruel, but true. And the same applies to other reality TV shows. Take, for example, the tenth series of Big Brother that starts tomorrow night. Should we insist that everyone who enters the Big Brother house is completely sane and ‘normal’ in every sense of the word? Good God, that would make for uber-boring TV! Maybe before we all start calling for heads to roll for the treatment of Susan Boyle, we should consider this fact. Odd folk make for great entertainment. And we all love a great breakdown, especially if it’s on live TV. I must agree with your statement regarding reality TV. 2000 years ago, we used to congregate in large crowds to watch colourful personalities beat the living bejeezus out of each other until one person fell over and died horribly, all for our personal enjoyment. It was a great day out, -bring your kids! Now in the modern era, reality TV is our sublimated gladiatorial ring. People put their personalities on the line to the howling mob, and we allow them to live or die with the same ruthlessness as a Roman baying for blood. I for one, quite enjoyed Susan Boyle's rendition of 'I Dreamed a Dream'but will freely admit to the fact that it was primarily due to a) shock factor and b) I love the song and in fact all of Les Miserables and would do unspeakable things to anyone who could sing any of their songs reasonably well, Susan Boyle included, (because mad Scottish women in their autumn years are hot). But honestly, if people aren't aware of what they're getting themselves in for when they sign up for this kind of thing then they probably aren't in a fit state to be on TV in the first place, or watch TV for that fact, in fact its best that we should probably put them away in a sanitarium somewhere. Perhaps the government are less interested in reality television and the state of its performers, and more interested in how it highlites how wide spread mental health is as a concern in the UK and how pitiful is the governments response to it?